Description: A master blueprint for flexible housing from a pioneer in the field. 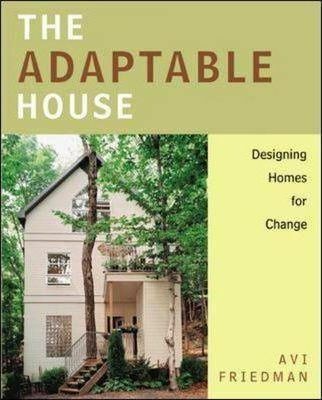 Award-winning author Avi Friedman believes that the homes in which we live should not be regarded - or designed - as single purpose, unchangeable physical environments incapable of adapting to the occupant's evolving needs. A home, he contends, should be constructed as a life cycle house where changes such as children being born or leaving the nest, elderly relatives moving in, or the need for home office space are all easily accommodated. This powerful, eloquent resource provides a clear, systematic guide to the conception and construction of adaptable homes that can be quickly, easily, and inexpensively altered to reflect the new needs of owners. Packed with floor plans, drawings, photos, and charts to fully illustrate the author's suggestions, "The Adaptable House" is more than a persuasive argument for designing and building flexible structures - it is an innovative blueprint for putting principles into practice. 'A conflict exists between the dynamic nature of occupants' lives and the homes in which they choose to reside.